For those of you planning some travel to Hong Kong soon, and looking for shopping tips, here is one from me: Nomera Jewellery, in the Aly & Rachelle boutique, Unit S411, PMQ in Central Hong Kong. 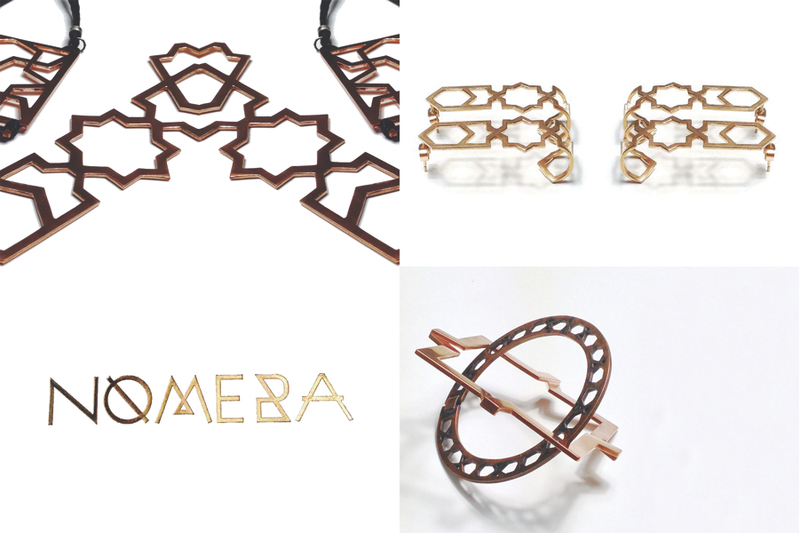 Originally a fashion designer working in London, Kuwait and Beijing, Nomera Ajmal is now a jewellery designer in Hong Kong, where she launched her first collection in May. Nomera is also a good friend of mine, who I met in a north London share house almost seven years ago. Here are a few things she told me about her designs. Why the change from fashion to jewellery? After all most a decade in the ‘fast fashion’ industry, I wasn’t feeling challenged anymore, and was also struggling to get a job during the global recession for more two years. While I was unemployed, I had the time to work on experimenting with jewellery and started to playing around with ideas. This led to doing more research, and designing a collection, and that’s when the switch happened. I wanted to create pieces that make a statement as well as look feminine but with an edge. At the moment I’m focusing on using semi-precious, and precious, metals such as copper, brass, silver, rose gold and gold plated. What has inspired the design of your first collection? 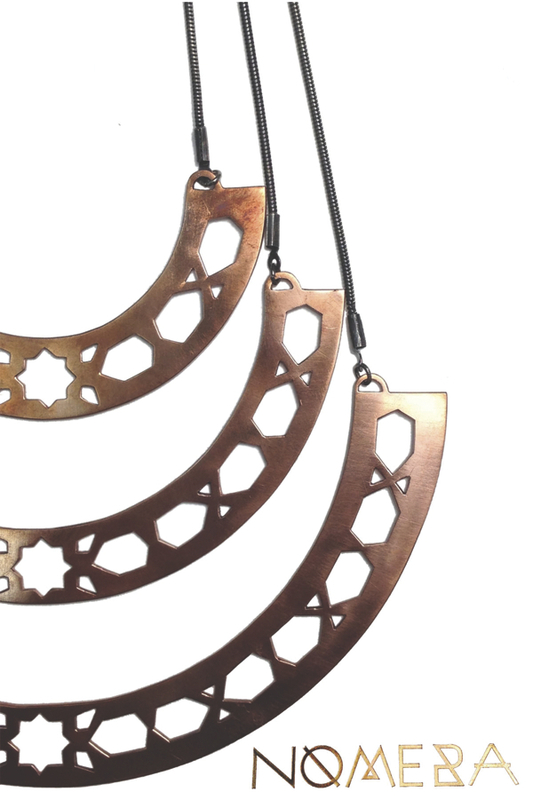 The collection has been inspired by Islamic geometry within architectural structures. I have a huge love and respect for the craftsmanship, skill and patience that goes into creating these strong shapes using marble, stone and wood. So I wanted to transfer these strong graphic lines and cut-out detail onto metals that can be wearable in a very new and modern way. You’re well-travelled Brit who has worked in the Middle East and China, and taught in Mexico. How have your different travel and living experiences influenced your designs? I’m a very visual person so my travels and living abroad has a huge influence when I design. Like most creative people, I’m like a sponge and soak up everything around me. My ideas can come from anywhere from huge architectural buildings to some shape or form from nature. What gets you most excited, fires your passions, when making jewellery? Two things. First, the process from the 2D (the idea/design) to 3D (the actual product). I can get lost in the making process, this helps me to connect with the product and feel passionate about it. Second, when I see people wear and appreciate what I’ve created. I want them to have something they can love forever and never get bored of, the opposite to the mentality fast fashion/trends has created. You are a start-up in Hong Kong – are there any other local ‘creatives’ you have worked with who have helped or inspired you to get your first collection launched? Yes there are many local creatives here in Hong Kong, although there haven’t been any collaborations yet! I would love to work on some projects in the near future with other local creative brands. For now, being a beginner and just stepping into the market, I’m focussed on getting myself noticed… who knows where that might lead to! Have there been any stages in setting up your business that you thought it might not happen? Yes the main point in setting up a business itself, I was kind of thrown in the deep end with my first opportunity, I just went with my gut instincts and went for it, taking each day as it comes. I have come so far, this makes me believe I can go further. What advice do you have for creatives starting out, and wanting to make money from what they love creating? Don’t think too much and just start somewhere, anywhere and keep at it until you have the basics laid out. Also, don’t think to far ahead, obviously have a goal but don’t think too much about how your going to get there. Focus on the now, and everything will fall into place. Where else can we buy your jewellery, if we aren’t in Hong Kong? My collection will also be sold online very soon at www.nomerajewellery.com. We’re planning to ship internationally, as I have had a lot of interest from different parts of the world. If you have any enquiries I can be contacted on email through the website, or you can follow me on Instagram or Facebook. Read more about Nomera, and other jewellers in Hong Kong, in this Style by Asia web article. *All images on this page were provided by N0mera. *All images on this page were provided by Nomera.